Poured into a 12 oz. stange glass, which worked perfectly. Dark, saturated burnt umber tone. Light tan foam, a finger or so, then it settles to a skim with wispy edges. Lace drips its way back into the liquid and hangs around the edges. Alcohol is somewhat perceptible, along with some toasted malt character and hoppy spice. Bready, tobacco, brown sugar. Fruity esters surface in the taste, cantaloupe or melon, plum, dried fruit and bitter walnut. Low to medium bitterness, hop flavor is herbal, earthy, and fresh. Very malty, a rich blanket of toasty malt tidal waves across the palate. Carbonation is somewhat low, but it doesn't distract. Definite sipper. S: Herbal & woody hops mix with brown bread. T: Follows the nose along with figs, raisins, dryness & grainy/boozey persimmons up front. 12 oz bottle poured into a pub glass. Very weak head, a 1/4 inch at the most, with no lacing. Very disappointing. I wasn't sure what to expect from this style, but do expect a decent head. It's part of the visual enjoyment of drinking a beer. Body has a caramel color, much more interesting than then head. Smell is a big improvement over looks. There is a lot of sweet caramel aromas. A little burnt raisin bitterness. There is a mild alcohol burn in the background. Taste has more caramelized sugars and figs. The alcohol warmth comes off as burnt orange peel. It is strong but flavorful. Mouthfeel has a medium body with a thin carbonation. There is a light creamy texture that goes down smooth. This is very easy to drink at 10% ABV. 12 ounce bottle. Served in a stange glass, the beer pours a murky brownish/red color with about a half inch tan head and some sediment floaties noticable in the glass. Head retention and lacing are both OK. Aroma is bready malt, dark fruit, toffee, and some caramel. I think the taste is similar to the aroma, but there's the addition of some booze, molasses, and a medicinal flavor that was noticable as the beer warmed up more. Mouthfeel/body is medium/full, it's slick and syrupy with a good amount of carbonation. The more I drank of this, the less I liked it. I don't think it's a bad brew at all, but in the end I just didn't care too much for it. This one tastes bold. And strong. I can feel the hair on my chest getting thicker (I really don't need this). The color is a near perfect dark orange. The boozy taste goes well with what I have been eating and drinking. Actually I think this style would go well with heavy food with moderate flavors. It would be the focal point of the meal. I will have this again (even though I WORK for the man - I am a henchman, don't ya know). A - Poured a clear, dark brown color with a small, tan head of foam. I had lengthy head retention and left patchy trails of lace on the glass. S - Aroma was floral and malty. Not much else. T - It had a nice spicy hop bite upon first sip. Very malty flavor with some sweet caramel. D - O'Fallon had their ABV cap lifted and they've gone big with a 10%+ Wee Heavy and now a 10% Altbier. This is quite good though. A- Dark brown topped with a thin off white head. Head dissipates almost immediately to a ring and leaves little lace on the glass. S- Sweet malt, caramel, and molasses, there are some biscuit notes in there as well. T- Malty and sweet right away, caramel and candied fruit provide the backbone of this one. Some heat from alcohol at the finish and sweet blackstrap molasses as the final note. M- Thick and vicious in the mouth, with low carbonation. It leaves a coating on the palate as well. D- Too sweet for my taste, there is no counter balance to the sweetness. The 10.0% ABV is easily notice at the finish and in the nose at it warms. Alt beers are one of my favorites styles, but not this one. It's a little too sweet and boozy for me. Pours a clear, copper color. 1/4 inch head of an off-tan color. Decent retention and slight lacing. Smells of sweet malt, slight hops, hint of roasted malt, slight caramel malt, and slight pine. Fits the style of an Altbier. Mouth feel is smooth and crisp, with a low carbonation level. 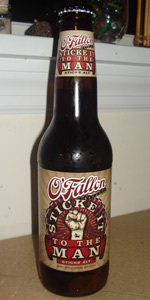 Tastes of sweet malt, caramel malt, hops, slight citrus, hint of roasted malt, and a hint of alcohol. Overall, not complex and weak appearance, but decent aroma, blend, and body. A - Transparent caramel brown color with ruby highlights and lots of bubbles. Pours with a dime of off-white foam that settles to a thin ring and a few bubbles on top. A few tiny splotches of lace. S - Fruity esters, some alcohol, nutty malt character, bread and yeast. T - Taste is brown sugar, nuts, sarsaparilla, and booze. The alcohol is a little bit too harsh for my liking. I don't like this as much as the nose, as it's sort of solventy and unpleasant. M - Creamy, viscous body that has a bit of grain to it, low carbonation, a little bit of warmth. Finishes very sticky. D - I foolishly opened this expecting a nice session beer and didn't notice this was a Imperial Sticke. I'm not sure I've ever had a craving for such a thing. Don't think I'd have this one again, as it took me quite a while to work through all 12oz. Poured from the bottle a dirty mahogany color with floating sediment and a thin off-white head. Faint malty aroma with a touch of dark fruit and an earthy graininess. The taste was malty with a bit of dark grains. The 10% was fairly well-hidden. A touch of bitterness in the finish. Lighter bodied with a sharp carbonation. A decent Altbier but nothing I must have again. Pours a clean ruby-amber, with substantial off-white head. Exquisite, detailed lace. Beautiful! Nose is caramel malts all the way. Hops here are dialed way back. Malt fans, rejoice! Taste is also a more toasty caramel malts, with subtle hints of an almost fruity note submerged beneath. Sticke Alt is a rich tasting experience, with nary a hint of the high 7.5% ABV. A solid drinker, but, for me, one to enjoy slowly. A: This beer pours a murky, milk chocolate brown. A 1/4 inch of khaki colored head sits on top. Head disappears immediately and leaves no lacing to speak of. S: Nose is BOOZY! Under the booze, you can pick out a bit of caramel and toffee. T: Taste is extremely boozy as well. Caramel, toffee and molasses give a real sweetness to the middle of this. Some raisin mingles in. M: Medium body, medium carbonation, chewy feel with a sticky finish. D: Goes down ok, big kick, somewhat filling, ok representation of style. I wouldn't grab this one again in the future as the booze is a bit too much for me. I'll sticke it to my taste buds with this brew. It's full-bodied and high alcohol lets it's presence known. It has a dark ans cloudy brown look with a ton of sediment swirling about the bottom. The aroma is a mix of maple syrup and plum. The aroma is more plum with sweet malt and a hint of orange. It's smooth but leaves a bit of a tingle. It hides the alcohol well. It's very nice and worth another try. 12 ounce bottle poured into lost abbey glass. No date on bottle. Pours an amber color with absolutely no head after an aggressive pour. Some carbonated bubbles line the outside of the glass but quickly fade. Appearance resembles tea. Smells of sweet caramel, malts, some fruits including plums and fig, and a subtle but present hop presence. Taste has plenty of caramel but also has a sweetness from maple syrup. Mouthfeel is also somewhat syrupy. Quite a bit of alcohol is on the palate as well. Overall this is a decent brew. Truly unique and a new style for me. Taste is nice with the sweetness. This pours up a murky, dark golden brown color. It forms a small head of light brown colored foam, which dissipates fairly quickly. It leaves a spotty surface covering film. The lacing is in medium-thickness strands, which are nicely sticky. Loads of big malt notes are on full-attack. Light touch of roastiness. Big, bready, yeast notes. Light hints of dark fruits, packed in dark brown sugar. Light boozy presence. The booziness is much more pronounced in the flavor. After that, the taste follows the nose quite well. There is an unexpected light trace of coffee notes. A nice touch of leather. This is almost full-bodied and has a light level of carbonation. It is quite smooth and has a good touch of creaminess to it. This is very tasty and easy to drink. It has a bit of booziness which will keep you from drinking it to excess. It is also a great example of the style, though a little bit 'boosted'. My first altbier, as far as I can recall. Pours a beautiful cherry-mahogany, a bit turbid, with a thin head. Not much carbonation. Nose is interesting; fruity, molasses, maybe a hint of rye bread. Green banana, sour cherry, and something akin to spritzy lemon-lime soda. Mild on the whole. Mild, too, on the palate, perhaps more so than the nose. A bit unpleasant, really, the more of it I drink. Tannic and chalky, boozy, a bit of astringent nuttiness, mild tart cherry, somewhat grainy. Quite full bodied, drying finish. A bit oaky, it seems, which unfortunately only adds to the tannic woodiness instead of giving some nice caramel and vanilla notes. I'm really not sure just what to do with this beer. Presentation: 12oz brown screw cap; awesome label. No date on this, but I'm pretty sure this is a little bit over a year old; drank one of the 4pk, cellared the rest. Appearance: Attractive walnut beer with a bit of sediment in suspension and a nice dark ivory cap which shows pretty nice retention. Smell: Noble hop presence up front, which I wasn't quite prepared for somehow. This is fairly clean, though there is a nice bit of dry, toasty caramel in support of the hops. Light traces of alcohol. Not a ton of depth, but pleasant, and I'm typically not one for big Noble Hop aroma or flavor, except in Pilsners. Taste: Bitter leads here as well. Some light herbal and floral hop flavors, with a decent kick of hop bitterness, a bit surprising actually. The bitterness is clean, but at almost IPA levels. Hop flavors are balanced with smooth but present alcohol, with some light, dry caramel notes in the background. Overall: Really cool that O'Fallon took a shot at this style, even this over-the-top interpretation. It's not unpleasant in any way but, for me, there's not enough malt to support the high hop rates and the alcohol (which, to be fair, doesn't taste like 10%). This was $9.99 a 4pk...at that price, I MIGHT pick this up fresh if they were to brew it up again. I'd have to give this one a B-.